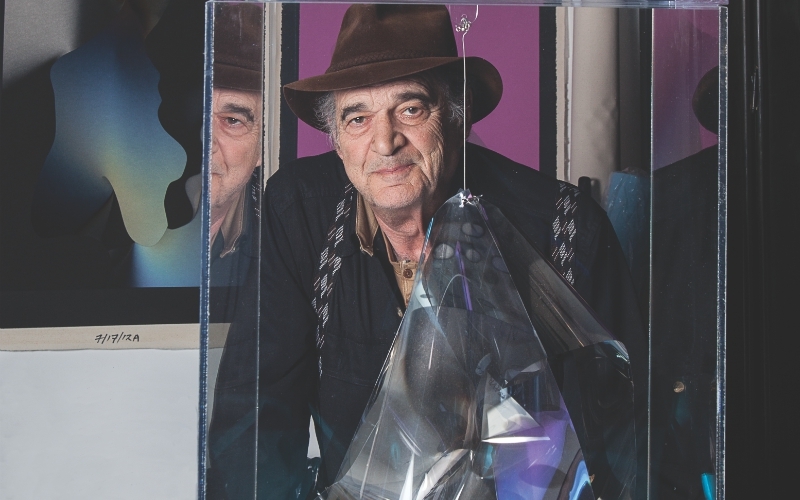 When the prolific L.A.-based Light and Space artist Larry Bell was starting his career in the late 1950s, he was chasing a dream we’re all familiar with: reaching a permanent state of “funemployment.” The difference between him and the rest of us is that he actually managed to catch it. “I had no real ambition to do anything,” Bell says matter-of-factly, as if this should come as no surprise to anyone. “That’s what artists do: They work for themselves.” At the moment, the 78-year-old is holed up in his second studio, in Taos, New Mexico, where he’ll spend three weeks before returning to a primary workspace in Venice. (Bell, who has called the beach city home for nearly 60 years, is so ingrained in the town fabric that the Windward Avenue restaurant Larry’s was named after him.) The back-and-forth is in preparation for Complete Cubes (June 23 through September 23), a survey at Hauser & Wirth gallery downtown exhibiting more than 20 works from Bell’s career. The West Coast Light and Space movement was a response to New York Minimalism, when East Coast artists like Donald Judd and Frank Stella eschewed the tumult of abstract expressionism for austere, architectural pieces. Bell and contemporaries like Robert Irwin (Bell’s professor at Chouinard Art Institute in the Westlake District), John McCracken, and James Turrell absorbed the aesthetic and clapped back with California-specific works influenced by L.A.’s characteristically ethereal light and modern manufacturing tech. Most of the glass boxes Bell creates are vacuum-coated with a thin film of vaporized minerals, similar, in the most basic of ways, to the lining of a potato chip bag. The grayish tones or mirrored surfaces modify light as it passes through the sculpture. Some, like a quartet titled Venice Fog, feature smaller colored cubes within clear translucent cubes; others feature glass that’s barely tinted at all. Complete Cubes, Hauser & Wirth, 901 E. 3rd St., downtown; June 23-Sept. 23. RELATED: The Hammer Museum Is Tapping Into Local Talent With Made in L.A.